As part of your workplace’s technology overhaul, your local integration expert will merge the controls for every light into your encompassing automation system. Through this new system, you will be able to perform simple tasks, such as turning on every light in your workspace, with the press of a single button on an in-wall device or your own smartphone or tablet. What distinguishes an automation solution, though, is how its intelligent capabilities save your business from unnecessary energy spending. We can install occupancy sensors throughout any of our commercial projects. When an employee walks into an equipped room, lights will automatically turn on. When the room is empty after a set amount of time, the lights will turn off – so that you don’t needlessly spend more. Of course, you still will be able to control each room’s lighting independently, as well. 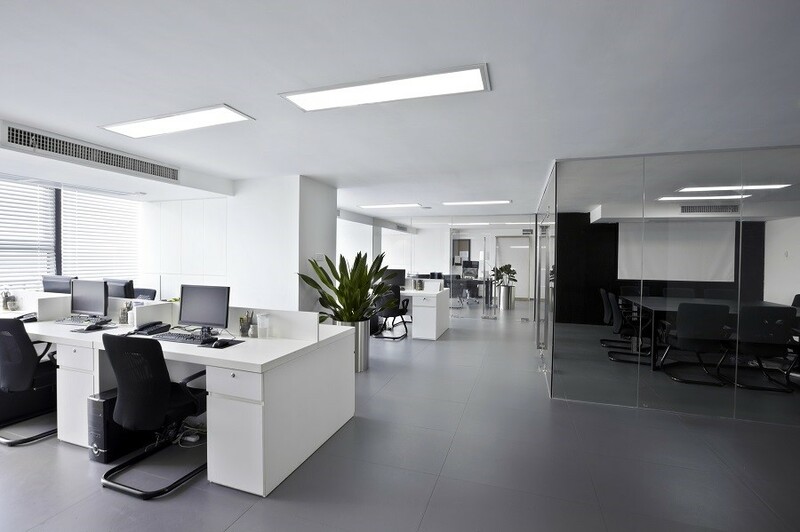 Employees will still be able to turn lights on and off in their office and dim them to their preferred levels. You can also schedule for all of the lights in your workspace to turn off at a set time. And with a truly integrated solution, you’ll be able to turn every light off remotely, just in case. If the windows in your workplace often bring in direct sunlight, those hours of the day might be irritable for your employees. It can serve as an unnecessary distraction and even allow your workplace’s interior to warm up. That’s why we find motorized window treatments to be such an essential part of our commercial automation solutions. During our installation, we will include photosensors that will indicate when direct sunlight is hitting a window. When that happens, motorized blinds automatically will roll down. Not only does this keep your employees focused, but it also keeps your workplace cool – which is especially helpful during the approaching warmer months. Your smart commercial automation system wouldn’t just feature your standard thermostat. Instead, it will be connected through your entire automation solution, enabling you to achieve more efficient climate control of your workplace. You will still be able to adjust the thermostat throughout your workday to you and your employees’ preferences. But while your workspace is unoccupied, your thermostat can launch into “eco-mode” – a preset mode that optimizes for energy efficiency. Even during your workday, your thermostat can provide eco-friendly temperature recommendations that can minimize energy usage. Best of all, intelligent thermostats are proven on their own to save homeowners and businesses on energy consumption. In an integrated automation solution, though, they can be even more useful for your company. At Reference Audio Video, we proudly deliver commercial automation solutions for business owners in Urbandale and throughout Iowa. Want to find out more about our services? Click the button below to get in touch with a member of our team today!